I thought I’d end the holiday week with a forgotten song post for the last Friday in November. Since I mentioned it on Thanksgiving Day, I’ll spotlight the song resurrected most recently in Wes Anderson’s wonderful adaptation of the children’s novel written by Roald Dahl. Fantastic Mr. Fox. The upbeat, up-tempo number used for the final sequence in the film that brought a smile to all who watched. 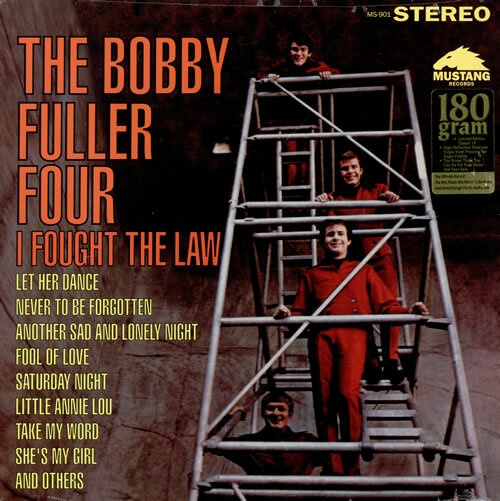 Let Her Dance was written by Bobby Fuller, and his first Top 40 hit in 1965. Influenced by a rock icon, the Texas-born Fuller splashed on to the 60s with this the kick-off to his popular singing career. Unfortunately, just like his idol Buddy Holly, he wouldn’t get a chance to meet whatever promise his song brought with it. Much the same as others who’ve migrated to L.A., a dark destiny met up with Bobby Fuller in one of the notorious deaths my hometown is unfortunately known for. When people recall the ill-fated artist, this track always seems to take a backseat to Fuller’s second hit. The more popular, I Fought The Law. Though both were on its namesake ’66 album. I Fought was a wonderful tune tailor-made for the pre-psychedelic rock portion of the period. Still, Let Her Dance remained an infectious track, heavily influenced by fellow Texan Holly. My mother would be so proud to hear me say that. If anything, the needle-dropped song Wes Anderson used, in a trademark touch his work has become known for, sublimely capped his Fantastic Mr. Fox. Essentially, a throwback to Buddy Holly’s era of 50s Rock ‘N Roll. For sure, it was a big hit locally in Los Angeles. Between the energetic guitar riffs, and Fuller’s driving vocals, there was something more. Listen to the song’s lyrics and you’ll spot its proud defiance. Announcing the singer’s not bothered by his girlfriend’s rejection. The exuberant tone of the singing in direct contrast to the burden of the words flowing out. The hints of regret and hurt still emerge. Pre-dating by a decade 10cc’s I’m Not in Love, it’s another of love’s denials done by ballad. Sock-hop variety to be sure. Catchy to groove to, but poignant when you pay heed to what it’s saying. Because of one filmmaker’s tack, it ended up in my library and on my iPod. On account of Wes Anderson’s stellar animation film, my kids and I have played and danced to it ever since.